Marker at a trail head. calm quiet peace...for a moment it feels like all is right in the world. my words just don't seem adequate. For here we sense life's proper goal. 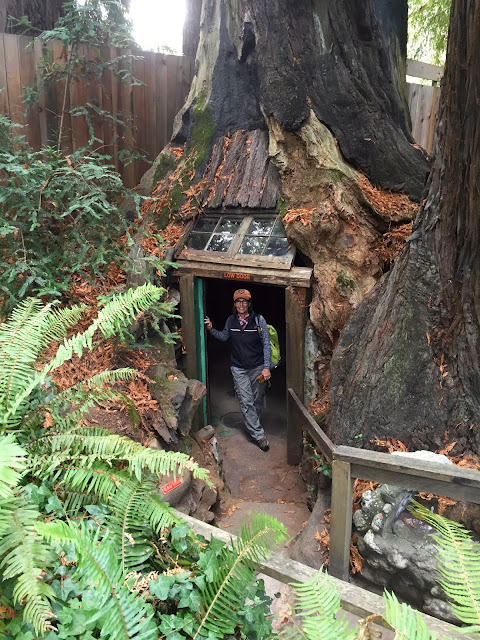 The Eternal Tree House was once a huge Redwood estimated to be 2500 years old when it was cut by loggers in the early 1900’s. The remaining stump contained a huge cavern caused by fire. 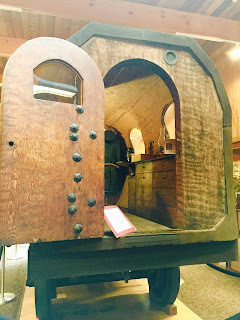 It was used by Indians, trappers and even livestock for shelter. In 1950 the 20 ft area was made into a gift shop. Although the original trunk of the tree is gone, the stump remained and continued living. 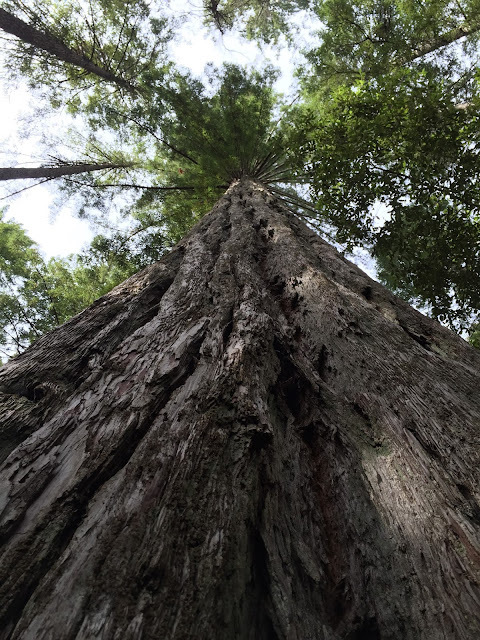 Today it is the parent of more than a dozen Redwoods which grow from the stump’s roots and are now more than 40 ft high. 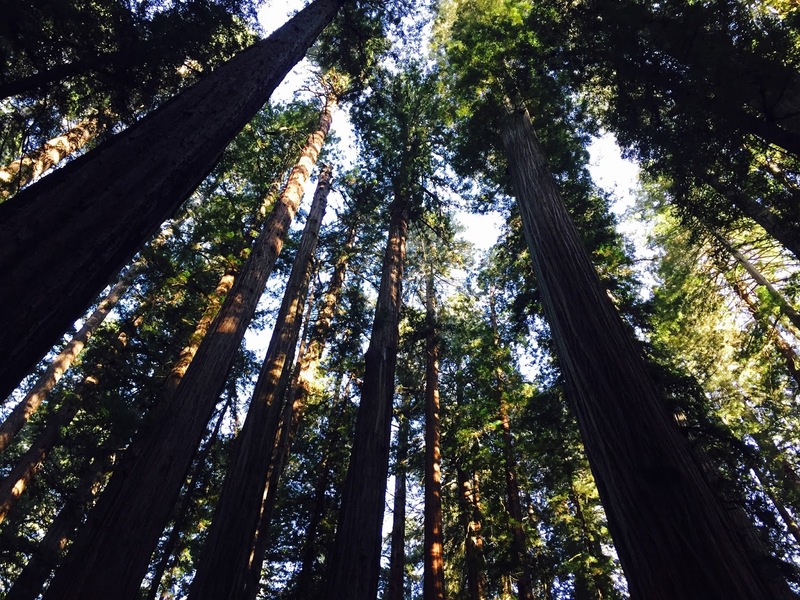 The Eternal Tree House is located on the Avenue of the Giants highway in the little burb of Redcrest. Our campground was also on the Avenue of Giants highway about a mile from here. 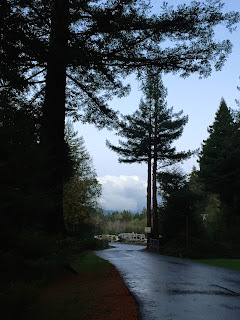 Ancient Redwoods RV park was one of our favorite RV parks. 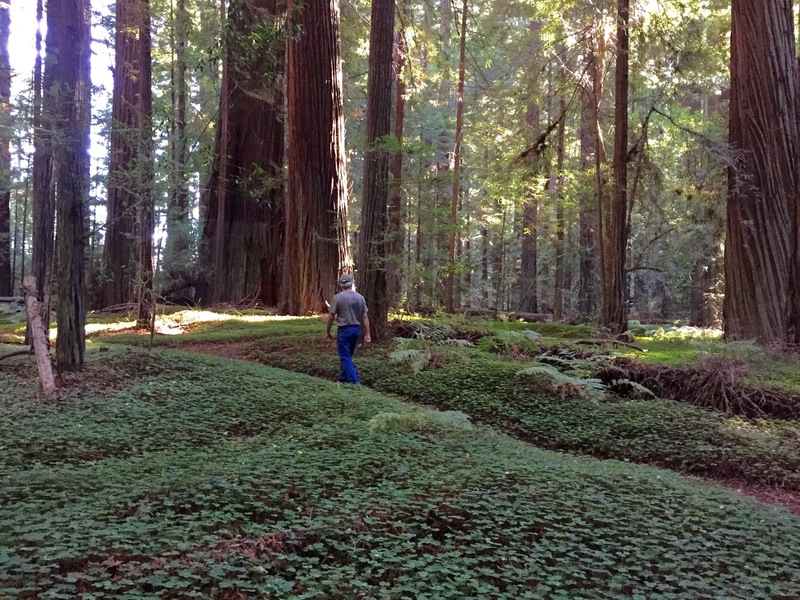 The Redwoods have remarkable resilience. They are nearly immune to insects, decay and fire. They have a thick bark (up to 12” thick) that provides protection, it contains a resin that is distasteful to termites and insects. When exposed to fire the bark chars and turns into a heat shield of sorts. What an amazing tree. 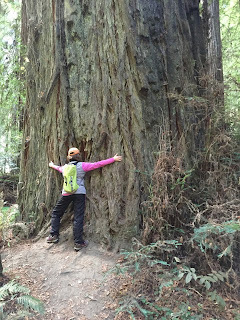 Hard to believe but this Redwood is still alive and thriving, the branches on top looked like any other healthy Redwood. These cavities have been caused by fires over many years. Intense fires can penetrate the bark through cracks, the heartwood in the middle of the tree is "empty wood or dead wood", the tree gets it's nourishment from the outer wood under the bark. 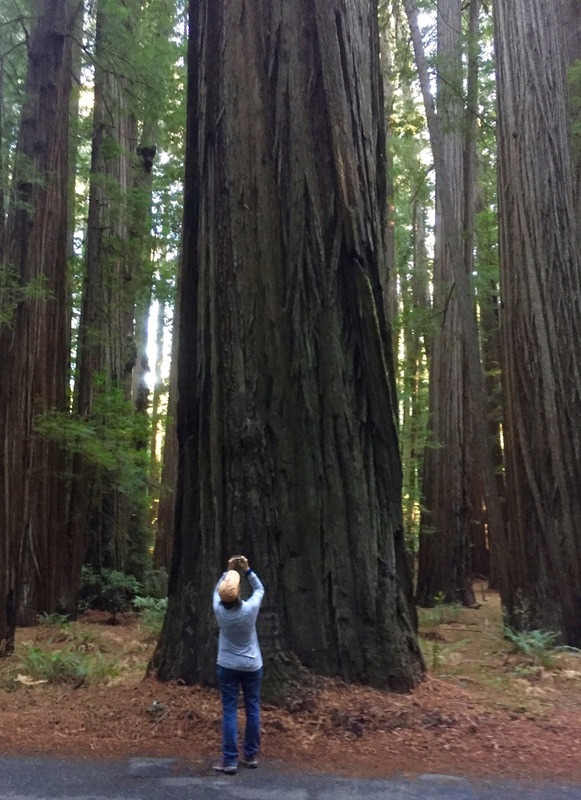 Can you ever take too many pictures of the Redwoods?? In looking at my photos on the computer the answer is yes. 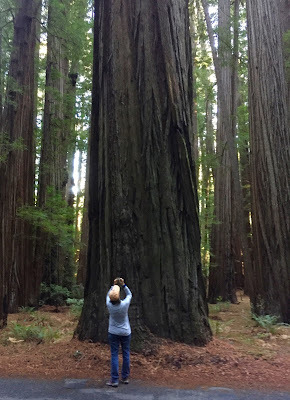 As much as I tried, photos don't capture the grander of these trees and the forest. 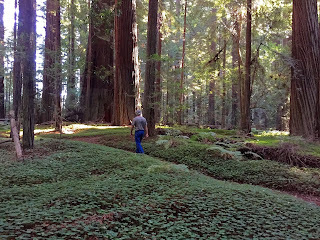 There are many different groves within the Redwood National Park, these groves were either from land donated to the park or money was given to the Redwood Preservation Foundation and the grove was then named after them. The groves range from small acreages to 1,000's of acres. 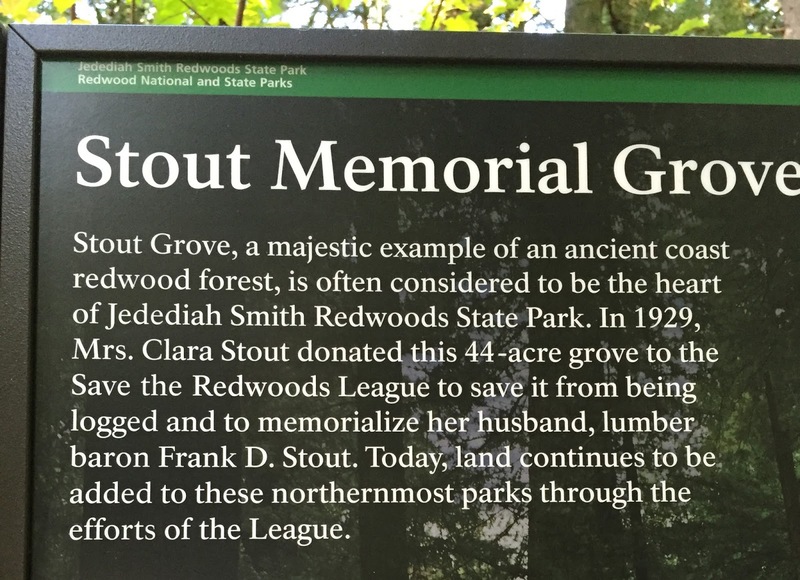 To mention a few, there is the Roosevelt Grove, Lady Bird Johnson Grove, Rockefeller Grove and Founders Grove. 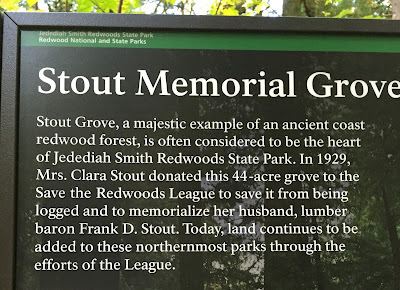 We heard about the Stout Grove and didn't realize until we arrived at the trailhead and read the sign that we were quite familiar with this name. Back where we come from in WI, the Stout name was huge in logging. There are streets named after him and his partner, Knapp. The Stouts built a beautiful mansion of a house on an island on Red Cedar Lake, accessible only by boat. It has passed hands several times but is still known as Stout Island. We learned that the Stouts were also involved in the lumbering business in the Redwoods. this beautiful canopy over head. In the early 1900's, Charles Kellogg built a camper out of a hollowed out Redwood tree and traveled the country bringing awareness to preserving the ancient Redwood trees. It was called the Travel Log. It was mounted on WWI military truck. Today we realize what a gift his (and other's) forward thinking has given us. Many Redwoods with burned out cavities are alive and thriving in the forest. I liked our reflection in this sign. 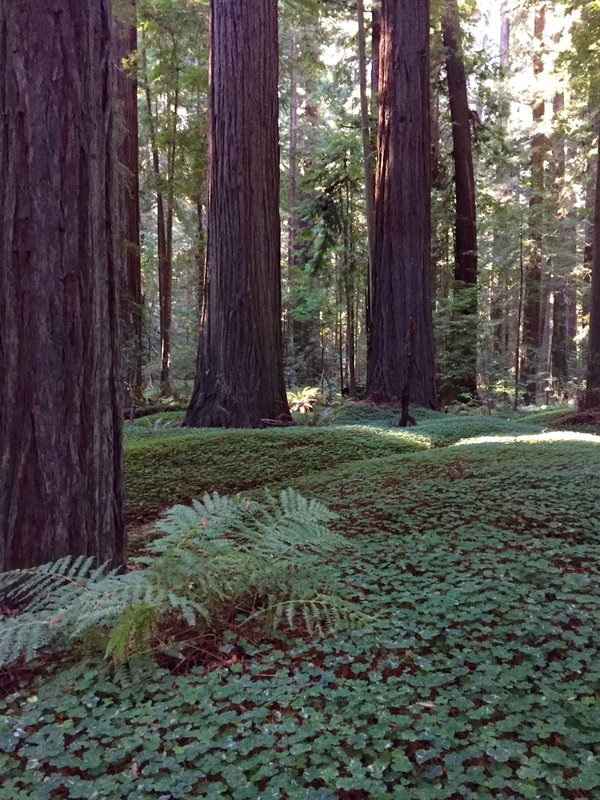 Redwoods sprout new trees from the fallen trees or limbs. 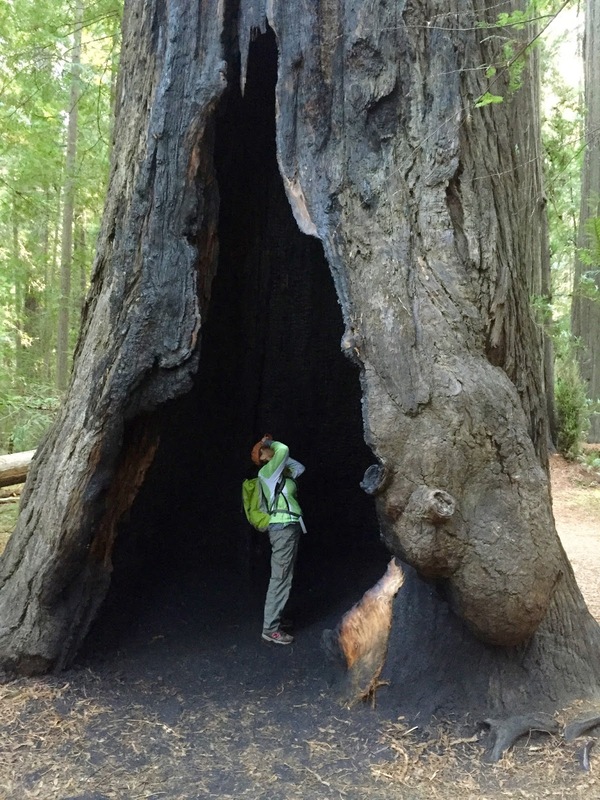 Here you can see a new tree sprouting from a rotting redwood. 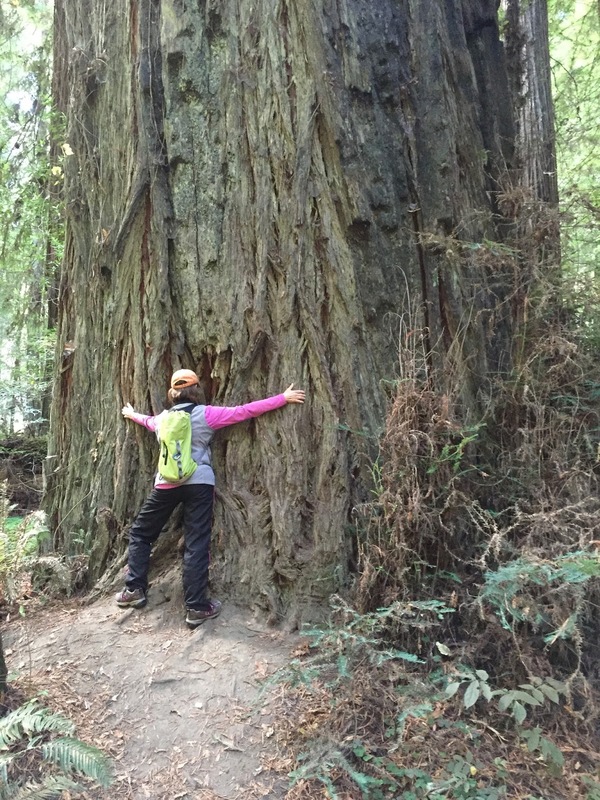 Another Redwood that survived the ravages of man (the tree is still alive). Known as the girded tree, back in the 1900's it was stripped of it's lower bark which was used for siding on a small building that served as a tourist attraction. Hard to believe this is all natural. 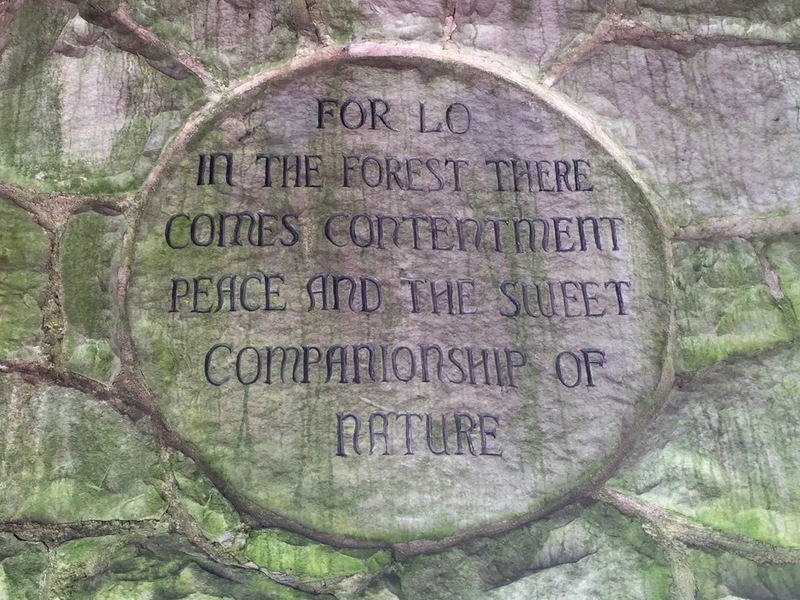 This grove with all the greenery looked like a well kept park, but it was just another grove in the forest. I'm not sure why this one had so much of the clover like greenery growing while others didn't...but it sure was beautiful. Our campground on the Avenue of the Giants highway.